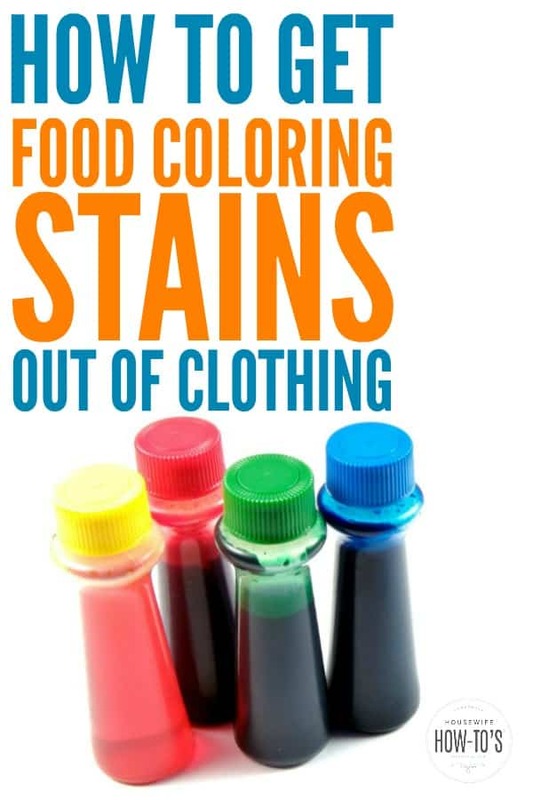 Get Food Coloring Stains out of Clothing -- Even Old Stains! I needed to know how to get food coloring stains out of clothing thanks to my son and a little incident with an exploding frosting bag. I won’t go into details (mess! everywhere!) but I will never again wear a light-colored shirt while frosting cookies. Yes, I should have thought of that beforehand, but it’s one of my favorite shirts… and that made getting the food coloring stains out even more important. Maybe you’re not big on baking — that’s okay. There are still many other ways you might find yourself needing to know how to get food coloring stains out of clothing. Most of them have to do with kids: popsicles, Kool-Aid or soda, and candy all contain food coloring that can leave stains behind. Or say you made homemade play dough for the kiddies, for instance. Great stuff, and it’s lots of fun on a rainy day, but wow does that stuff stain clothes! Regardless of how the stain got there, here’s how to get it out. As with most stains, it’s easier to treat a new spot than one which has already set in. 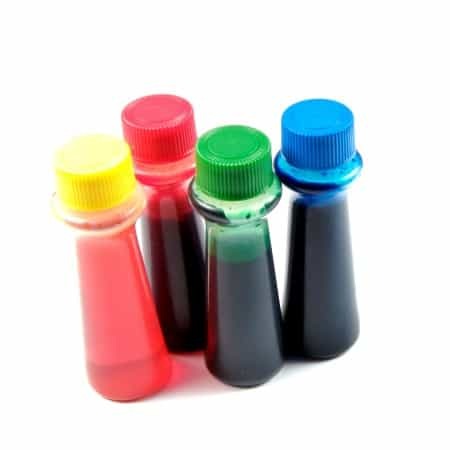 Fortunately, getting either new or old food coloring stains out doesn’t require any specialized products or equipment, just ordinary things you should already have in your cleaning supplies or laundry room. White fabrics can be immediately laundered with bleach if allowed by the manufacturer’s label. For dark or brightly-colored clothing, follow the steps below. 1. Grab a table knife and scrape off as much of the spot as you can. 3. When you’ve dabbed away as much dye as possible, soak the stained area in a shallow bowl filled with 1 cup cold water, one tablespoon white vinegar, and one teaspoon liquid dish soap. If necessary, weigh the fabric down with a coffee mug, so it remains immersed in the soapy water. 4. After 15 minutes, rinse it under a cold faucet with the stained side down. The flow of the water will help pull additional dye out of the fabric. Once the stain is completely gone, launder as usual. 5. If the stain persists, move onto the next method without allowing the stain to dry. 1. Combine 1 quart of warm water, one tablespoon of hydrogen peroxide, and one teaspoon liquid dish detergent in a bowl. 2. Submerge the stained area in this solution, weighing it down if necessary. Allow the fabric to soak for 15 minutes then gently rub it from the back to loosen the dye. Rinse very thoroughly under warm water with the stained side down. Launder immediately. Did you get it on the carpet? Naturally, my frosting bag explosion wasn’t limited to splattering just my favorite shirt. The frosting landed on my laminate counter and kitchen rug, and some even got on our popcorn ceiling! If something like that happens to you, I found out that rubbing alcohol cleans the stains off laminate counters super fast, and these steps to get stains out of carpet worked for my kitchen rug. Don’t ask about that ceiling, though. Yes, my favorite pants just got stained with red! Looks a lot like I had a period problem! I really hope i can get it out because how embarrising? Will this work for food color paint!? It should, but I haven’t personally tried that. I have several stained items in my laundry room that I am going to try this technique on. Thanks! Visiting from Thursday Favorite Things Blog Hop. Excellent tip – we do stuff with food coloring all of the time and without FAIL it gets onto someone’s clothes. Now I can get the stains out thanks to you! 🙂 Pinned! Wow thanks for sharing on Keep it Simple, with all the cupcakes and stuff I make I will be using this often instead of tossing the shirt into the rag bin. Glad to help, Heather. Thanks for hosting! thank you for the tips will definitely try do you use a particular brand of dish soap or just any dish soap. Good to know; I enjoy frosting cakes and often find a few spots here and there on my clothes. Good luck with your ceiling! I know my mom used to get mold and spots off her ceiling spraying a bleach solution onto our ceiling using a spray bottle; I’m not sure if that would work in this case though. That’s an excellent tip. I’ll give it a try, and thank you! Thanks for the Pin, Lisa! Wouldn’t the knife cut or rip tiny fibers eventually causes a thin spot if not a whole in the fabric ? Table knives don’t have sharp tips. You could also use the edge of a spoon or even an old credit card.